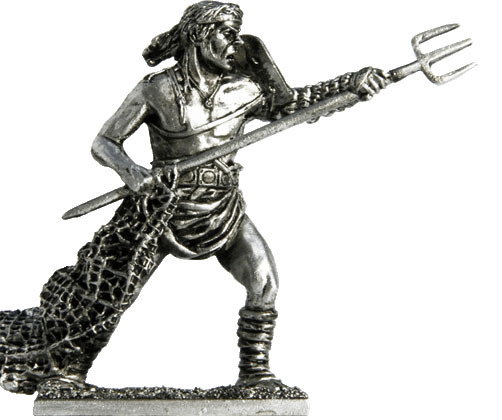 Retiary (retiarius, rete - net) - the type of gladiator weapons which consisted of a trident (fustsina), a dagger (pugio) and the fishing net. The left hand was protected by a cloth quilted Boots (Manica) and Bronze Shoulders (gallery). Retiary opponent was heavily sekutor. Couple retiary - sekutor represented the in the arena of battle the fisherman and fish. Roman gladiators, becoming - slaves, prisoners of war criminals and volunteers. Slaves in Roman Law were regarded as a thing rather than people. Prisoners of war were also a commodity, and particularly valued for their ability to to use arms. Convicted criminals as punishment sent to gladiator school, or immediately into the arena. But already in the 1 st century AD, the bulk of the professional fighters were Roman citizens, who were engaged in volunteer gladiators.